Video clip synopsis – Bougainville's nine year path from local conflict through full scale war to eventual peace is revisited by ABC journalist Sean Dorney. Broadband MP4 longroad_bb.mp4 (13.1MB), suitable for iPods and computer downloads. Long Road to Peace is an excerpt from the two-part documentary Paradise Imperfect made in 2000. 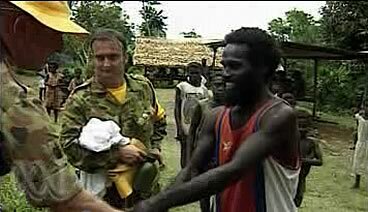 In 2000 the ABC’s Pacific Correspondent Sean Dorney travelled to the war zones of Bougainville to look at the impact of the nine year secessionist conflict and the fragile peace process. An Australian Broadcasting Corporation production. Understand the impact of foreign policy on Australia’s near neighbours, including relations with regional leaders. Understand the impact of Australian foreign policy on factors such as domestic politics, human rights, refugees, international opinion, international conflict, trade and economic blocs. Discovery of copper deposits in Bougainville in the 1960s led to the development by Conzinc Riotinto Australia (CRA) of the Panguna open cut mine, at that time the largest in the world. Bougainvilleans were denied what they saw as fair compensation and share of mine profits. The Papua New Guinea Independence Constitution stated that land ownership was to just below the surface and that mineral rights belonged to the state. Tensions exploded in 1988 when disgruntled landowner (and later secessionist campaigner) Francis Ona led sabotage attacks on the mine. This marked the beginning of a nine year conflict. Following negotiations led by New Zealand, the civil war in Bougainville came to an end. A truce monitoring force came to Bougainville in 1997 under the auspices of the United Nations, and marked the beginning of a long and complex process of reconciliation. By the late 1990s there was a power shift in the Bougainville Revolutionary Army (BRA) from militants like Francis Ona to moderates like Joseph Kabui, who had the support of Sam Kauona; the moderates were willing to participate in peace talks. In 2001 a ceasefire agreement committed Bougainville to a referendum on full independence from Papua New Guinea in 10 to 15 years. In 2005 a provincial government was elected, led by Joseph Kabui . The new Bougainville administration will run the island with much greater autonomy, while the central Papua New Guinea government will control defence and foreign affairs. Though up to 15,000 people died as a result of the conflict in Bougainville, the Australian population remained largely ignorant of the civil war. Women activists in Australia and New Zealand helped support women in Bougainville: this contact was influential in bringing in support and assistance to the island. The Australian government policy committed to Papua New Guinea as a unified government; Australia could not deal with Bougainville as a separate entity. The loan of helicopters by Australia to the Papua New Guinea Defence Force, helicopters which eventually had machine guns mounted to them, further ensured that Australians were not trusted on Bougainville. The Bougainville conflict made Australia change its policy towards the Pacific. Benign neglect was replaced by a policy of re-engagement with the region. Australia realised that good governance and stability were essential for the peace and prosperity of the region. The involvement of Australia in Papua New Guinea was as a result of Australia’s foreign policy at the time. Explain the reasons why Australia did not intervene in Bougainville. Evaluate the strategies used within the community to a move towards peace in the community. Share other strategies you know of that promote peace. Describe how effective they are. Consider a comparison between the strategies used by women and those used by government. Describe the insights that Sean Dorney has being a reporter on the ground. How are these insights played out in terms of maintaining peace in the region? Using this video clip to develop briefing notes for a new film documentary entitled Bougainville Today. Bear in mind Australia’s foreign policy created to maintain national security, promoting economic and trade interests, expanding regional and global links and promoting the nation as a global citizen. You may interview Sean Dorney on his insights into this situation as well as government officials. Prepare an outline of those that you would interview to develop a particular point of view on this situation in Bougainville, linked to the formation of Australia’s foreign policy. For interview transcripts, books and references for this Digital Resource go to Pacific Stories, choose My Valley is Changing, select INDEX, and go to MORE INFORMATION.